Want to Eat Well in the West? Reader dear, a friend read my pathetic appeal for writing help and came to my aid. Step forward Ms Karen and take a bow. I owe you a debt of gratitude. To recap, bored witless with my own witterings, I appealed to the generous blog reading public to guest post for me. I suppose my ‘niche’ loose as it is, is writing and food. Karen and her partner are keen foodies – in the nice way, lately the term has become something that is less than complimentary, implying snobbery and elitism. That is certainly not true of my friends who are as at home in a Wetherspoon’s pub as they are in a Michelin-starred restaurant. Anyhoos, Karen wrote me a lovely piece on her culinary adventures in Cornwall, with reviews of some of the places she went to. The tourism industry is alive and well in Cornwall, which means there are many, many places to eat. Some of those places take advantage of the hungry hordes and trade off well-established names (ahem!) whilst others go out of their way to provide delicious, exciting food and are happy to cater for special diets. Karen’s a coeliac (celiac my American friends; your spelling makes much more sense*). Second time round, we both had mackerel pate on toast. As I hadn’t specified I need gluten-free, I just skipped the toast, but the pate was just delightful – just the right amount of seasoning and a lovely taste of mackerel. We both had lemon posset with blackberry ice cream and home made short-bread for pudding. I had a wee bite of the short-bread as it wasn’t gluten free, and it tasted delicious and buttery with just the right bite. The lemon posset was a revelation – smooth, creamy and very tangy too. It worked so well with blackberry ice cream. We would thoroughly recommend the place. It cost us only £10 for three courses and our bill on both days came to only £26.20 as we had water and coffee at the end of the meal. 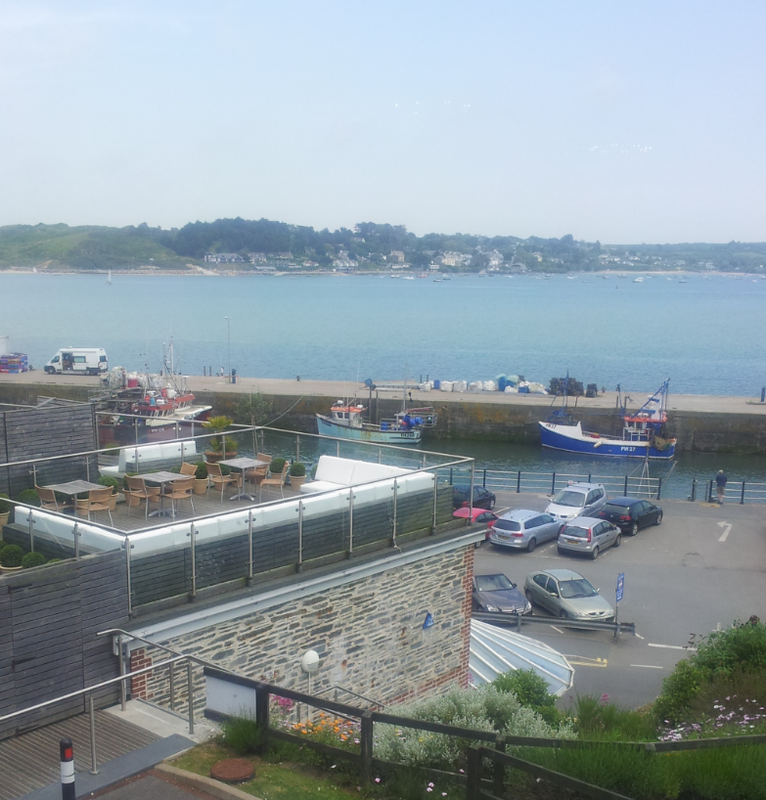 Service was excellent, efficient and very friendly – the hotel is a must is anyone is in Padstow. It is a special offer though – and only on a Wednesday. To start with we had a couple of cocktails: Dirty Martini for my partner, which was almost pure alcohol, and I had a Dry Manhattan which was exquisite, very drinkable. Starters: My partner had smoked haddock with Stornoway black pudding. This was what he had the year before and loved it, but this year he was a bit disappointed as the chef had changed it slightly… (why, why do they do that??) The poached egg on top was slightly over-cooked and it didn’t run out like it did the year before. The dish was over-seasoned, although that could have been down to the fish. I had goose and pickles. This was goose liver parfait with clotted crème brioche. Smooth parfait, exquisite pickled veg which were small pieces of cucumber, courgette, cauliflower and just the right taste of pickling liquor. The brioche (not gluten free) was melt in the mouth fantastic, definitely worth the tummy ache the following day (and that was only because it was not gluten free). Mains: My partner had saddle of pork (served pink) with scallop and pea puree, and medley of hazelnut spring (peas, asparagus, green beans and raddish), and pork scratching. He was advised on ordering that the pork would be served pink. He loved it. The dish also contained slices of apple (paper thin slices) to complement the pork and it worked really well. The pork was delicious and cut like a knife through butter, very moist and tasty. Desserts: We both had Chocolate “Cake”. This was recommended to us by our taxi driver and he was spot on. It consisted of pistachio and chocolate slice topped with pistachio nuts, chocolate ice cream on a bed of chocolate soil. There was also a chocolate sponge with a disc of Caramac on top. When he presented the dish, the waiter poured hot Caramac sauce onto the disc and we sat there and watched it melt into the sponge to reveal a gooey chocolate fondant inside. It sounds rather heavy but it was not. Surprisingly it all worked well and was actually quite light, but a definite chocolate lover’s delight. We ended the meal with a cheese board which had six British cheeses on it. Our favourite was the Tunworth cheese. This is an unpasteurised cow’s milk cheese from Somerset and is full flavoured with a hint of cabbage overtones – sounds weird but it worked brilliantly. So there you go. Should you ever be in the Padstow area, you’ll now where to go and when. I like any place that serves up six different kinds of cheese for a cheese board, so pennies and time permitting, my next culinary destination may well be Number 6. **Hogget is the name for a sheep between lamb and mutton stage. A teenage sheep, I guess. Fantastic memories of great food. Just shows even gluten free food (well I mainly ate gluten free) can taste great. Thanks Emma for reminding us of fab holiday. Good stuff and thanks for supplying copy!